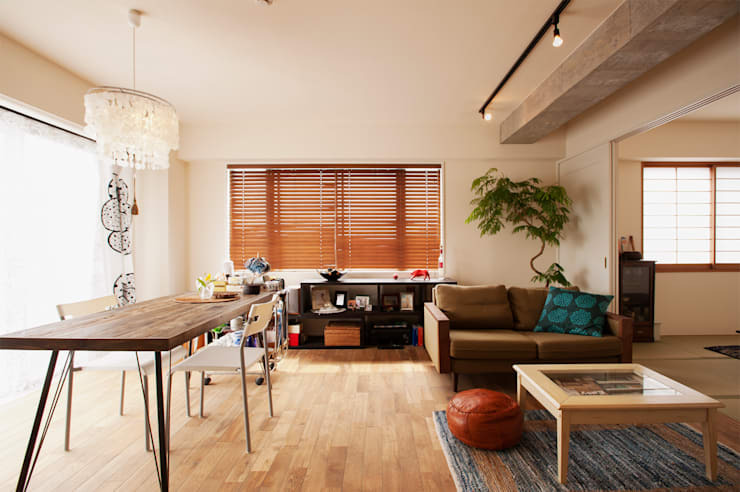 Today on homify, we're taking you on a tour of a Japanese apartment which perfectly exemplifies how to distribute living zones. The bare bones of the apartment are fairly standard, so there are plenty of interior architecture ideas that could easily be reimagined in many modern apartments. Restoration and renovation professionals, StyleKoubou, have decked it out with some cool retro furniture and bespoke features. The look is very carefully balanced, so the interior has a slightly eclectic, modern aesthetic. But it's better to explain in photos, so let's begin our photo tour! The original layout of the living area was subdivided into separate living zones. These have been turned into one huge living space with a soft white theme. One of the original ceiling beams is still on show, but it has been finished in raw roughened concrete that blends seamlessly into the earthy natural decor. Note how the wooden floorboards and small Japanese tree add a lot of simple warmth to the rather simple living room decor. 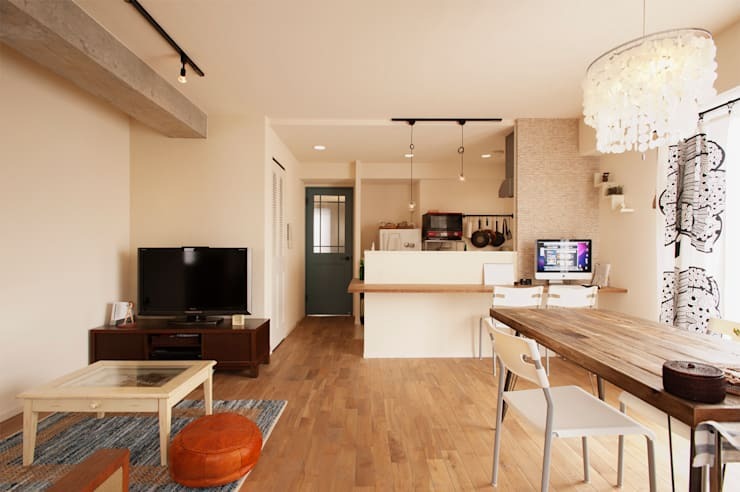 The renovated apartment is shaped as one long corridor. This creates a central passageway that has been used to separate the various living spaces. 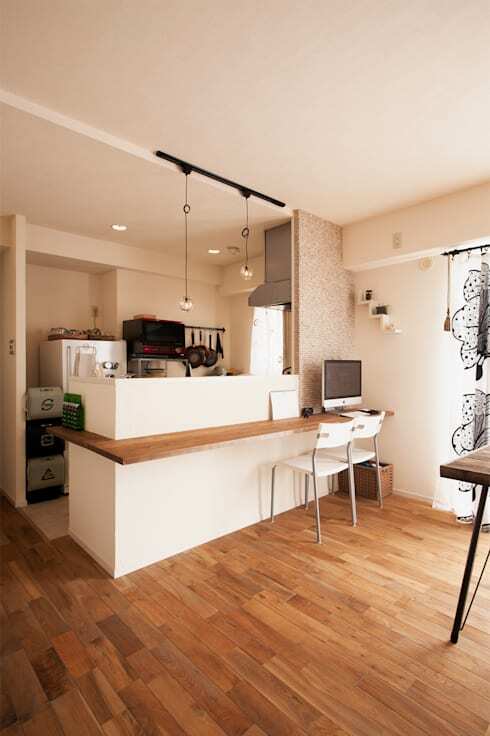 On the left we have a small living room, on the right a dining area and ahead is the kitchen. The traffic zones skirt each living zone to make a natural boundary around each area. This is a very effective way to separate the living spaces in a small home. Other takeaway ideas from this view are the wooden features that bring together the design so it works as a coherent whole. The kitchen features a really interesting breakfast bench. It has an unusually high panel that totally separates it from the kitchen. At the same time, it's just long enough to create a sort of separate small study area. This kind of kitchen bench or island is perfect for a small home because it hides all the clutter and activity in the kitchen from view. Also, note how the pendant lights further accentuate the boundary around the kitchen. Japanese interior design often showcases wooden features and here in this bathroom, we have a striking wooden bathroom bench. It has been shaped to run the width of the room and make the most of that awkward corner. 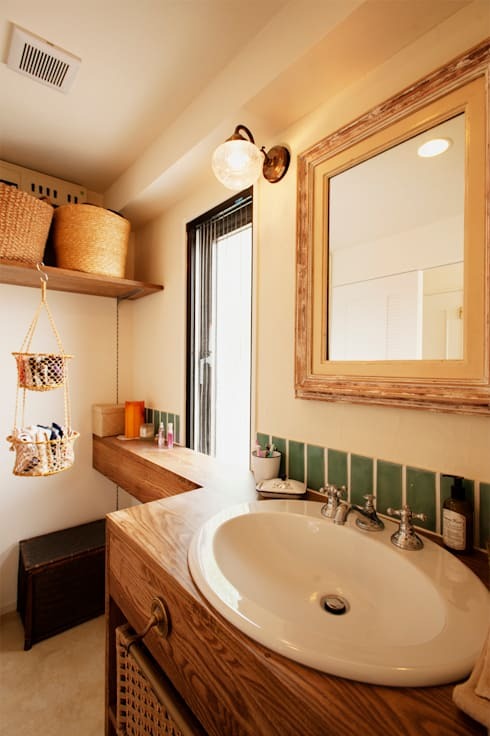 There is lots of open storage, but wicker baskets hide the clutter and add even more natural texture to the bathroom. This is a good approach for those wanting to add colour or warmth to an all-white bathroom. 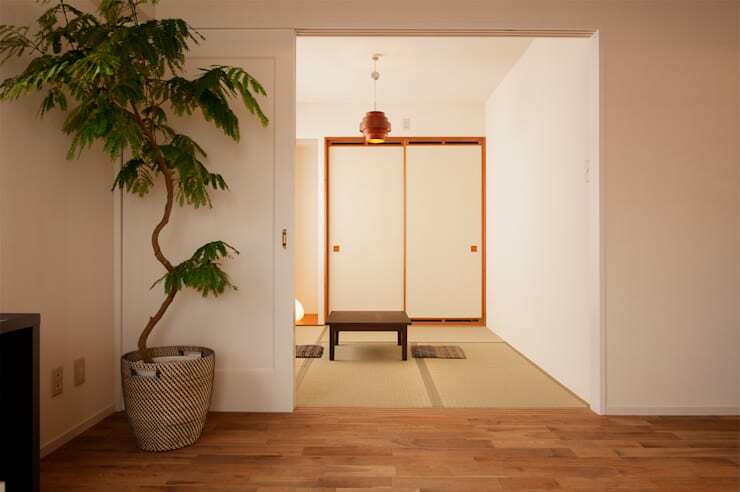 No Japanese home would be complete without a traditional tatami room. This one has floor mats and a low table. Tatami rooms are generally used to enjoy more quiet or social time, so it is fitting that this one is arranged adjacent to the main living area. It is also important because this is a room where one would never wear shoes. We love the fine wooden frame of the built-in closet. It adds that hint of warmth that gently connects the room to the overall design of the home. If this apartment has you yearning for the simpler things in life, have a look at: A chic apartment that proves less is more. What's your favourite view of this simple Japanese home?